Toscana In Bocca is a cooking school, but more than anything else it is a journey in yesterday and today's Tuscany throughout memories and reality. The memory of many traditions and the reality that preserves those traditions. 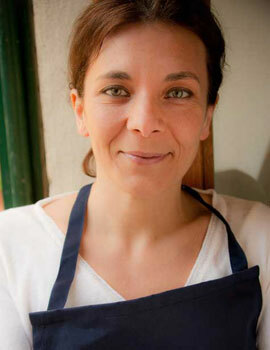 Stefania will tell food stories around a stove and around the table: the history of the countryside, of wine, of olive oil, of art, the history of Florence and Tuscany. She will pass on to you these traditions and whatever she learnt from her family. We will talk about the year around the table and what is produced and cooked during the different seasons. Together we will discover that preparing a meal has common basis throughout the world. We do not know a country well enough if we don't know also its culinary traditions. Toscana in bocca was born from the idea of teaching cooking not in a school, but in a real home. Stefania has a degree at the “Accademia delle Belle Arti” of Florence and she enjoyed studying the History of Florence and the Medici Family at University. She loves to entertain friends at home and values the table as a pleasure and meeting place. From fifteen years she has been working as a chef in different restaurants, but her true passion is teaching the thing she knows best. As a matter of fact, she taught cooking to children and people from all over the world.